Recently, for whatever reason, there has been a noticeable increase in the number of visitors here (UPDATE - this might have something to with it). This coincides with a major drop in my posting frequency, which is unfortunate. So I thought maybe I should explain. Earlier this year, around April, I asked a person whose opinions I respect for some feedback on my website. The outcome wasn't the glowing praise I hoped for, and in particular the observation that "it's a bit stuck in time (2000 to be exact)" stung a bit. So I decided to redesign it. And, of course, I bit off far more than I could chew. In theory it should take me two weeks or so to do a redesign, but in practice, I have about 6 hours a week from which I could take time to do it (and that 6 hours also includes photo editing, keeping my computer working, lounging in front of the TV, or generally collapsing on the couch after yet another fabulous 12 hours away at the "day" job). On top of that, the publishing software I use was urgently in need of upgrading to a newer version. Any upgrade of Expression Engine is a bloody nightmare, but this time practically every plug-in I use broke as well, so it took about 1 month elapsed time to sort that out. I then realised that a long history of quick fixes and "improvements" to my existing code had made it unmaintainable. So that needed to be cleared up. One more month passed by. Then I could start thinking about how to redesign the site. So, I tried looking at a few other sites for inspiration. Not much luck there - the vast majority of photographer's web sites are boring as hell, with exactly the same layouts, "clever" off-the-peg galleries with all the bells and whistles, which do all they can to ruin the viewing experience, and very, very little to encourage return visits. The quality of the photography is irrelevant at this point. I did look at a few website services, bot the only ones that passed even basic requirements for me were Squarespace and Koken, and both those have showstoppers. Woken is one I'm watching for the future, though. I've also been told that there isn't enough focus here on my photography. Well, ok, good point. 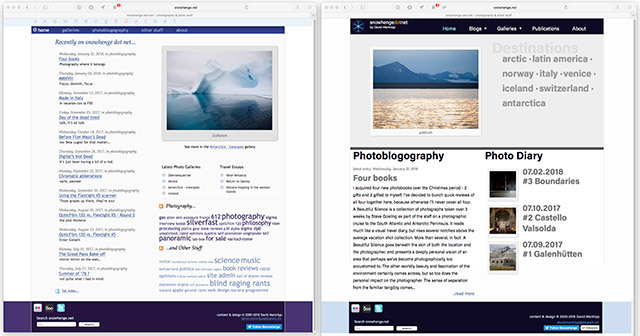 So I'm trying to address this in three ways: 1 - improve the accessibility and presentation of existing content, 2 - improve my curation, 3 - introduce a completely new channel for more ephemeral collections, called "Photo Diary". Oh, and put some emphasis on my very short list of publications. Unfortunately all of that is a lot of work. So, now, at the start of October, I have more or less completed the structure, and I'm working on the graphic design. Below is a snapshot of what the new front page looks like, right now. I've no idea if it will stay that way, or if it will ever come to light. So that's why I've been quiet recently. Anyway, it's only photography. And barely that, really. I think this is worth mentioning: I spent the better part of today trying to fix a layout bug in Internet Explorer 7, where a negative margin was applied to a floated image container. The image was cut off at the edge of the containing element. This is actually a well known-bug - in theory - and a reliable fix is to add a “position: relative” CSS rule to the floated container. But it didn’t work. On removing this, everything worked perfectly. So I just used a semi-transparent PNG as a fill image instead. Probably more efficient anyway. 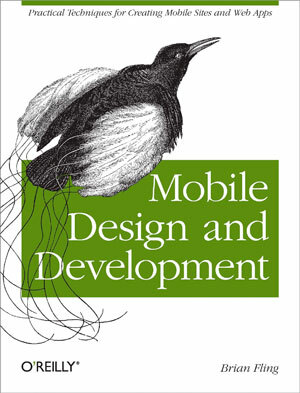 Mobile Design and Development, by Brian Fling, is hot of the presses at O’Reilly. In fact the publication date isn’t until next month, but it can be read in digital form at Safari Books. I’ll say it right away, this is a 5-star, thoroughly excellent book. The biggest puzzle is why it has taken so long for somebody to write the definitive text in this space, but anyway, Brian Fling has nailed it. Written in a deft and engaging style, with a touch of weary cynicism about the old operator-dominated order of the mobile space, and the legions of executives who neither get it, nor accept that anybody else does, this is an absolute must read for anybody getting into mobile development of any kind on any device. I really get the impression that every page has been obsessed over, that the author really, really cared about getting it as good as he could - which I’m afraid to say is not too common in the field of technical books, and especially some about the mobile web. The author covers pretty much all aspects of building mobile applications, from a discussion of the ecosystem (which should be a real eye-opener to newcomers), to the all-important topic of context, to mobile-specific information architecture, usability, interaction and visual design. Despite the big changes heralded by the iPhone and it’s competitors, the book is right up to date, including discussion of WebOS and Android. What I really like is the way he avoids sitting on the fence. Rather than surrender to the calls for lowest common denominator design, he encourages designers to be creative and take risks. In my opinion, there’s a strong argument for going out on a limb aiming to build an application people will upgrade their phone to be able to use, rather than be dragged down to level of 120 by 160 pixel monochrome devices - who’s owners are unlikely to be big data services users anyway. Some parts could be a bit clearer. For example, when the author discusses the concept of teasing the content to improve user experience, I’m pretty sure I know what he’s talking about, but the illustration given (figure 7.6) is so unclear that I’m half sure it’s an editorial error. Or it could be a case of over-channeling the lauded, but in my opinion, unnecessarily opaque, Jesse James Garrett. Surely an actual example with page screenshots would be a better way of getting the point across ? I’ve been working in this field for over 7 years, and I’ve experienced most of the frustrations described in these pages. There isn’t actually much in this book which is really new to me, but seeing things spelled out so clearly is refreshing and encouraging, and provides some very timely reminders. If you’re developing for any mobile platform, iPhone included, you will be well rewarded for the you invest in reading this book. Brian Fling has suffered so that you don’t have to ... well, not too much anyway.